Pure White Quartz Slab-welcome to china marmoglass, nanoglass, nano crystallized glass panel crystallized glass panel,crystallized white stone,white marble,minicrystal stone. 1. QUARTZSTONE is synthesized with high purity acid-washed quartz stone(93%),high polymer material(7%)and a small amount of inorganic pigment. 2. It is pressed under vacuum condition and high pressure. 3.Then processes fully automatic 36-unit to fix thickness,grind and polish. 4. 93% content of quartz stone ensures its hard and compact structure with excellent even smooth & bright surface. 5. The nonporous surface ensures its incomparable characteristic of high resistance to abrasion, compression, scratch, heat, corrosion and penetration etc. 6. 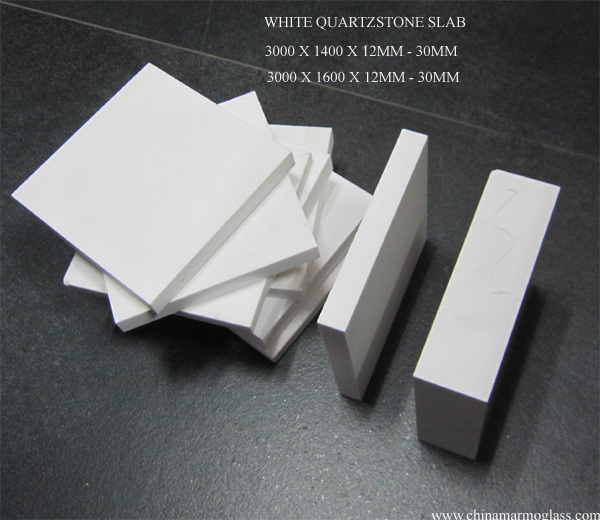 QUARTZSTONE is widely used for quartz countertops, quartz tiles,quartz solid surface,man-made stone,floor, wall, bathroom, windows, bars, furniture and so on. 1)High hardness, the Moh's hardness reaches to 6-7. 2)Resistant to scratch, wear, shock, rupture and compression. 3)Excellent heat resistance, corrosion resistance and stain resistance. 4)Not being distorted, split, and being resistant to discoloration, fading. 6)Environmental friendly building materials not contain any pollution and radiation. Artificial Quartz is synthesized with high purity acid-washed 93% quartz stone, 7% polymer material and a small amount of inorganic pigment under vacuum condition and through heterogeneous material aggregation technology.It is processed into fixed thickness products in high temperature, high pressure, grinding and polishing. Its high percentage of quartz crystal ensures its hard and compact structure, which makes it incomparable in the resistance to abrasion,compression, scratch, high temperature, corrosion and penetration. Quartz Countertops, kitchen tops, bathroom vanity top,worktops ,table tops,bench top, island tops, bar tops, backsplashes, shower stalls, wall tile, wall cladding, floor tile, and airport, station, shopping mall, hotel, bank, hospital. Based on the original series of quartz, we always develop new products.